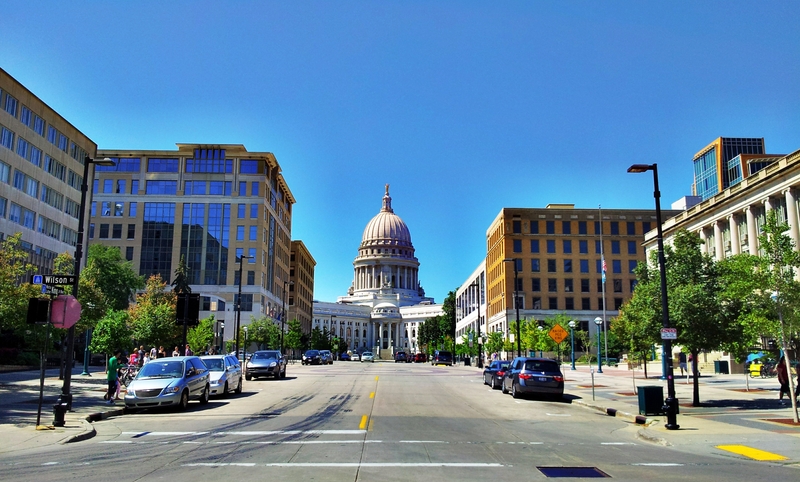 Madison, Wisconsin, is best known for two things: it is the state capital and it is home to the flagship University of Wisconsin (UW) campus.1 Unfortunately, it is not as well known for its tech hub dynamism. The city has a small but vibrant and growing community of tech startups, a well-educated population (including a high concentration of people with backgrounds in science and engineering), and a deserved reputation as a beautiful place to live. Madison is neither a major city nor a sleepy college town. At 640,000 people in the metro area, Madison sits in between these two extremes.2 The presence of the state capital and the state’s biggest university, both founded in the nineteenth century, have long given Madison institutional and economic stability. Although the region has an industrial history, traditionally that sector has been much less important. Predictability rather than dynamism therefore characterized the city’s economy for much of its past. The significance of UW to Madison’s tech ecosystem dwarfs that of other universities studied in this report. No other hub is as bound to the fortunes of a single institution as Madison is to UW. The University of Wisconsin-Madison counts as one of the world’s premier research institutions. With a three-billion-dollar budget, forty thousand-plus students, and more than two hundred research centers, UW consistently ranks among the nation’s very best universities for the quality of its research. UW does many areas of science and engineering well, not just a few, all on a campus that sits on a narrow isthmus between two lakes in the middle of Madison. That concentration enables much cross-pollinating of ideas. What separates UW from nearly all other universities in the United States and around the world, however, is the Wisconsin Alumni Research Foundation (WARF). WARF is an independent 501(c)(3) organization, founded in 1925, to protect intellectual property arising from UW research. All faculty, students, and staff are required to disclose their inventions to WARF, which takes the lead in guiding inventions through patenting and licensing processes, paying the costs of doing so, and fighting patent disputes when they arise. Through this mechanism, WARF fulfills its mission to ensure that UW research enters into the commercial bloodstream and that IP owners are protected. WARF has spurred scientific and technical research at UW for over ninety years. But while UW has attracted outstanding scientists and researchers, historically UW faculty have been much more interested in pure research than in entrepreneurialism. Even for a university as advanced in patenting and licensing of research (WARF provides faculty, staff, and student inventors 20 percent of all royalties from their inventions), historically there was a general reluctance to embrace business culture and commercial innovation. Recently, Madison’s story has evolved in an entrepreneurial direction. Madison’s Chamber of Commerce estimates that perhaps twenty-three thousand innovation-related jobs have been created in Madison over the past decade, across the biotech, information technology, business and financial, and knowledge sectors.5 The growth of firms like Epic Systems has meant an influx of both talent and money. The university, for its part, also has become more proactive in driving change. UW operates University Research Park, which hosts 126 tech firms and supports tech transfer from university research labs into the private sector. UW also now promotes an extensive set of activities focused on innovation, including startup clinics, training and certificate programs, and networking forums. WARF and UW, for example, now collaborate through WARF’s Discovery to Product initiative that is designed to “move UW-Madison technology and innovation to market.”6 These activities and platforms are intended to both de-risk the startup process itself—the research park, to provide just one example, provides high-quality infrastructure to startups—and to further expose UW faculty, staff, and students to entrepreneurialism. More broadly, Madison is building a national reputation for its attractive business climate. The high quality of life that Madison offers, combined with its low cost and ease of living (for instance, its short commutes), compares exceedingly well with larger hubs. Madison’s small scale but high density—the tech community is mostly concentrated in the city—gives the ecosystem social cohesion, builds trust, and enables people to earn reputations quickly. Madison's small scale but high density ... gives the ecosystem social cohesion, builds trust, and enables people to earn reputations quickly. These observations point to a bright future for Madison’s tech ecosystem. The seeds for long-range success have been planted, and the trend lines are moving in the right direction. UW’s evolving culture of entrepreneurialism is driven as much by students and the business community within the university as by STEM faculty. Just as critically, Madison now has private sector success stories that can be shared nationally with potential investors and new talent. Everyone in Madison hopes and expects that the virtuous circle will continue. But Madison’s continued success is not guaranteed, and there are reasons for caution. One of the more worrisome concerns is state politics. Over the past several years, the relationship between the state legislature and governor on the one hand and Madison on the other has deteriorated, in turn affecting UW’s budget for the worse. While there are multiple explanations for this situation, one of them is straightforward. The state’s economy is characterized more by stability, with traditional manufacturing and farming predominant, than by tech-driven entrepreneurialism. Most of Wisconsin is characterized by numerous small communities, in contrast to Madison and Milwaukee, which are very different in terms of demography and socioeconomics. Within the state, Madison therefore fights the stereotype that it is an elite bastion of intellectualism. UW has historically struggled to explain how it, and its tech-driven spinoff economy in Madison, are beneficial for all of Wisconsin. Madison, like other hubs around the United States, boasts useful ventures that are at risk of not being funded. Some of these have social utility that extend well beyond any commercial value. Stratatech, a Madison biotech company, shows how important it is to fund such ventures. Founded in 2000 by a UW professor and currently housed at the University Research Park, Stratatech’s skin replacement technology is a major burn treatment breakthrough. Federal government support, via contracts with the Departments of Defense and Health and Human Services, has been indispensable for the company’s scientific research and its commercial growth. So too has WARF, which holds several company patents.8 Although the cost of biotechnology research is going down, breakthroughs like Stratatech’s require both time and money to reach the commercialization stage. The biotech startup example points to a distinction that one often hears in Madison, between quality and quantity. The “fail fast” idea, deeply embedded in Silicon Valley’s culture, has not caught on in Madison. There is a greater reluctance to give up on startups, and more of a willingness within Madison to help entrepreneurs succeed. Part of the explanation is cultural, a reflection of Midwestern values about work, reward, and persistence. But part of it revolves around a conviction that entrepreneurialism should add up to something beyond commercial gain. Startups like Stratatech, so this argument goes, may be fewer in number but are worth having for their benefits to society. The University of Wisconsin-Madison is by far the largest campus within the University of Wisconsin System, which consists of more than two dozen campuses statewide: “What Is the UW System,” University of Wisconsin System, https://www.wisconsin.edu/about-the-uw-system/. The US Census Bureau estimated a 2015 population of 641,385 for the Madison Metropolitan Statistical Area. Data derived from American FactFinder, US Census, https://factfinder.census.gov/faces/nav/jsf/pages/index.xhtml. Epic, http://www.epic.com/about; “History of Ultratec,” Ultratec, http://www.ultratec.com/about/years.php. Ultratec spun off CapTel, which now employs more people in Madison. In the interest of full disclosure, Robert Engelke, Ultratec’s founder, is related to the report author. All data from WARF’s homepage at www.warf.org. Data provided by the Greater Madison Chamber of Commerce in June 2016. On University Research Park, see “Strategic Plan,” University Research Park, http://universityresearchpark.org/about/strategic-plan/. On discovery to product, see “About D2P,” D2P, https://d2p.wisc.edu/lean-start-ups-and-entrepreneurs/. For a thorough review of UW partnerships and initiatives, see the UW School of Business guide: “INSITE Entrepreneurship Guide,” UW School of Business, https://apps.bus.wisc.edu/insite-entrepreneurship-guide/. On the 2005 state law, see “Governor Doyle Announces Wisconsin Angel Network to Connect Entrepreneurs with Early-Stage Investors,” Wisconsin Governor’s Office, January 4, 2005, https://www.wdfi.org/newsroom/press/2005/AngelInvestmentNetwork.pdf. On HealthX Ventures, see “About HealthX Ventures,” HealthX Ventures, https://www.healthxventures.com/#about. Judy Newman, “Stratatech Lands $247 Million Contract for Burn Victim Treatments,” Wisconsin State Journal, October 6, 2015, http://host.madison.com/wsj/business/stratatech-lands-m-federal-contract-for-burn-victim-treatments/article_cc9a8711-1b20-50ff-9d50-6d1eb1ae2463.html; Judy Newman, “Madison's Stratatech to Be Acquired by UK Firm,” Wisconsin State Journal, August 12, 2016, http://host.madison.com/wsj/business/madison-s-stratatech-to-be-acquired-by-uk-firm/article_c4e884bf-4962-57a5-abd6-434690a1395b.html. See also a description of the science on the company’s website: “Core Technology,” Stratatech Corp., http://www.stratatechcorp.com/science/index.php.